The sternum and ribs of a 2-year-old showing advanced rickets. All of the entries for the UCL Pathology Collections Top 10 Medical Trail have been written by Nazli Pulatmen, who worked with us for her MA Museum Studies placement in the summer of 2018. Today’s specimen of the week post comes with a content warning for child death as a result of neglect. We’ve done our best to handle this topic with sensitivity and respect. 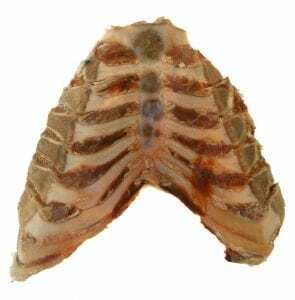 This extremely stunted sternum and ribs belonged to a 2-year-old who died of septicaemia – bacterial infection of the blood. The history we can glean from this child’s clinical notes is that they were brought to the Royal Free Hospital after showing flu-like symptoms for several weeks. This exceptionally undersized and misshapen specimen shows the shockingly degenerative effects of rickets in children. Rickets is caused by a lack of vitamin D in the body, which causes the bones to weaken and stop developing normally, as this specimen shows. As in this case, rickets is not usually fatal by itself, but often appears in people together with other disorders. Rickets results from malnutrition, which itself is a common result of chronic poverty. Mostly associated with the Victorian-era, rickets was almost entirely eradicated in the UK after the Second World War. However, childhood rickets has made an alarming return in the last couple of years, with children from minority groups and poorer socio-economic backgrounds disproportionately affected. It is estimated that 4.1 million children are currently living in poverty in the UK – up from 4 million in 2017 – and the number of people using food banks is at record levels. In April this year, the BBC published an article in which teachers from poorer areas described how they often saw their students fill their pockets with food from the canteen on Fridays, in preparation for the weekend ahead. Malnutrition amongst children and its consequences, which is plain to see in this specimen, seems to have returned as new normal. This specimen, and others like it which tell the stories of the history of medicine and disease, can be seen on display at the UCL Pathology Museum during the Open House event at the Royal Free Hospital next weekend (September 22 and 23). It will be featured as part of the Pathology Collection object trail which follows ten specimens and the human stories behind them.